Property 12: The ship De Luciana was built in 1916. A clipper built in 1911 in Woubrugge. Property 14: A clipper built in 1911 in Woubrugge. Great Locale, Great Facilities, Cool place to rent. We rented this charming houseboat last week for 3 nights. Felt very private despite overlooking the golf course. Lovely view especially in nice weather. Great for bike riding, walking, rollerblading, golf and tennis especially, and close to Leiden which looked like a nice place to visit although we only drove through. Location is a great base if driving to major tourist spots around Holland. 20 mins to Keukenhof (definitely worth a visit), 30 mins to Haarlem (interesting low key city). Amsterdam 30 mins. We only had 2 days. Felt very much at home on the houseboat, kitchen well stocked. Unfortunately no internet but you can use the tennis club next door. Terrific outdoor covered and uncovered deck and private yard area with charcoal barbeque. Clean. You need to bring your own towels (remember a tea towel too), quilt/pillowcase covers/sleeping bags and do minimal clean up with provided equipment before you leave but it's easy - just leave the way you find it. We brought our 3 and 6 year old and they loved sleeping on cots in the downstairs 'den' which was just enough room for them to sleep in but they loved it! Fantastic hot water and rain shower was cool. Plenty of storage if you're staying for a week. Mr Frank was very accommodating and we enjoyed the selection of DVD movies to watch. Great pellet fire when you need it and lots of doors to let the breeze through on a warmer day. Kids loved the evident wildlife all around - ducks and birds. We enjoyed walking to the windmill 5 mins away which is currently being restored. Modern restaurant and bar right next door. 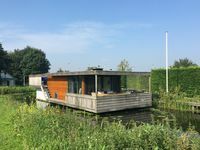 This place was great for our family and we loved the facilities inside and outside the houseboat so YES, we would definitely, and hope to return again in the future.